President Barack Obama awarded retired Army Lt. Col. Charles Kettles the Medal of Honor during a White House Ceremony on Monday, July 18. 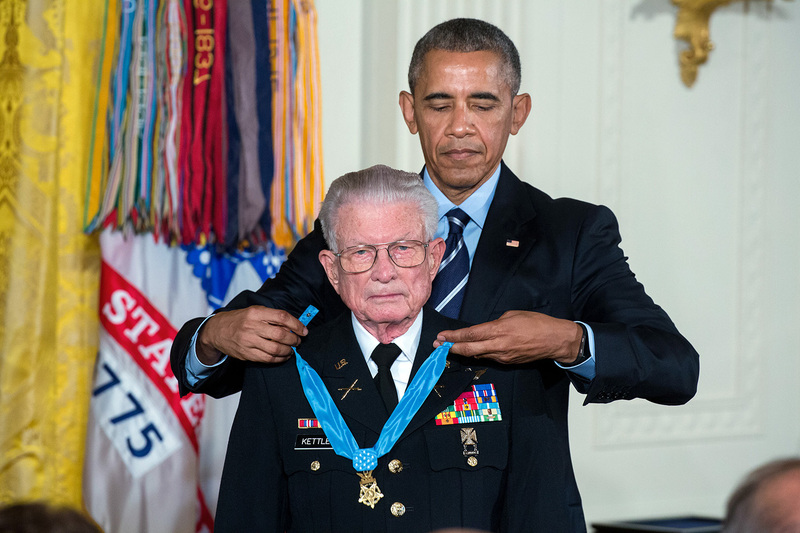 President Barack Obama presents the Medal of Honor to retired Lt. Col. Charles Kettles for conspicuous gallantry in the East Room of the White House. “You couldn’t make this up. It’s like a bad Rambo movie,” Obama said, describing the harrowing exploits of then-Maj. Kettles, on that fateful day, May 15, 1967, in “Chump Valley,” South Vietnam. Despite the dangers that they all were aware of, Kettles and his fellow company of soldiers took off in their Hueys. After flying the wounded to safety, Kettles returned to the valley a second time, the president recounted. He dropped off four soldiers and supplies and picked up more wounded. “Once more, machine-gun bullets and mortar rounds came screaming after them. … Rounds pierced the arm and leg of Chuck’s door gunner, Roland Scheck,” Obama said. His Huey was hit. Fuel was pouring out as he flew away. His helicopter was so badly damaged that he couldn’t make it to the field hospital so Kettles found another helicopter and took them to safety. By now it was near evening. Back in the riverbed, 44 American soldiers were still pinned down. “The air was thick with gunpowder, the smell of burning metal,” the president described. 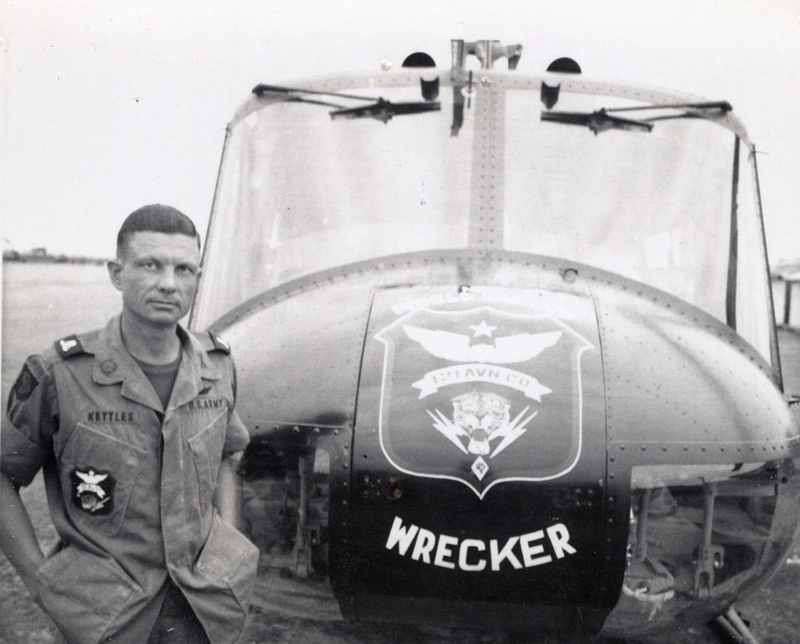 Then-Maj. Charles Kettles stands in front of a 121st Aviation Company, UH-1H helicopter, during his second tour of duty in Vietnam in 1969. For a third time, Chuck and his unit “headed into that hell on earth,” Obama said. “Death or injury was all but certain,” a fellow pilot had said. “And a lesser person would not return,” the president related. Once again, the enemy unloaded everything they had on Kettles as he landed: small arms, automatic weapons, rocket-propelled grenades. Soldiers ran to the helicopters as they had before. When Kettles was told all were accounted for, he took off. On the return flight, Kettles received a radio call informing him that eight men had not made it aboard. “They’d been providing cover for the others,” the president said. They “could only watch as (the helicopters) floated away. ‘We all figured we were done for,’” one later said. As soon as he landed, a mortar round shattered his windshield. Another hit the main rotor blade. Shrapnel tore through the cockpit and Kettles’ chair. Yet, those eight soldiers sprinted to the Huey through the firestorm. “The Army’s Warrior Ethos is based on a simple principle: A soldier never leaves his comrades behind. Chuck Kettles honored that creed. Not with a single act of heroism, but over and over and over and over. And, because of that heroism, 44 American Soldiers made it out that day,” the commander in chief said. The most gratifying part of this whole story, “is that Dewey’s name and Roland’s name and the names of 42 other Americans he saved are not etched in the solemn granite wall not far from here that memorializes the fallen in the Vietnam War,” the president remarked. “To the dozens of American Soldiers that he saved in Vietnam, half a century ago, Chuck is the reason they lived and came home and had children and grandchildren. Entire family trees, made possible by the actions of this one man,” the president concluded. Kettles, 86, was joined at the ceremony by his wife Anne. They will celebrate their 40th wedding anniversary next March, the president said. With them were eight of their 10 children and three grandchildren. “It’s the Kettles family reunion in the White House,” the president noted.